Barron's. Essential Words for the TOEFL. Barron's Ed. Series: 2014, 6th. ed. - 352p. 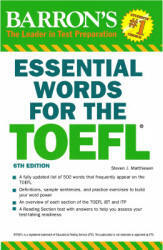 This 6th edition of Essential Words for the TOEFL has an extensive, revised list of 500 words with improved exercises and updated reading selections. This edition makes Essential Words one of the most thoroughly researched books of its kind. It is the product of extensive study of previous TOEFLs and academic materials from which the questions on the TOEFL are produced. The result of this research is this powerful book of words that will lead you to success on the TOEFL.